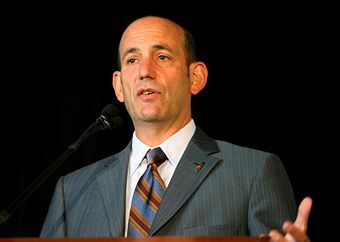 Major League Soccer commissioner Don Garber was at the AT&T Sports Franchises and Facilities conference, hosted by SBJ/SBD. He took part in a little Q&A and offered up some interesting nuggets on expansion and TV ratings. We are focused on New York. It’s a big market. The Cosmos have a great legacy and they have a great soccer history that so far the Red Bulls have not been able to tap into. For the most part Red Bulls fans come from New Jersey. The challenge for [the Cosmos] is to build a stadium, and as we all know New York City is not the easiest place to build. And we’ve put a high price on the 20th team. In 2007 we were asking around $7 million, and last year [teams] sold for $40 million. This could be in the $75 to $100 million [range]. Dang. That’s a hefty price-tag for a new club but honestly we shouldn’t be shocked by that number. Plus it is a team presumably in New York, so driving up the expansion fee makes a little more sense in that manner to me. We have talked with [the Wilpons] about MLS. They have a good situation when it comes to stadiums in the site around Citi Field. Willets Point is one of the largest pieces of undeveloped property in New York. Like I’ve said before, it all comes down to stadiums in New York and if the Wilpons have the land for it, MLS needs to find a way to do something with them. I have a small hunch that before long the Wilpons and the Cosmos will get together and iron out some stadium details for a MLS team. But the clock is ticking on that. I had lunch with [an NHL friend] and we spoke about their deal with NBC and Versus, and talked about our situation as a challenge and an opportunity. We have to convert those fans who are part of the global game. We are similar to the NHL; however they are not competing with Russian hockey like we are competing with the Premier League. We need a product to convert those fans, and we do it by having good stories in local markets and better promotion. You think about what has driven hockey, it was strong local teams that had great local TV deals and passionate supporters. The soccer audience is big. Chelsea versus Manchester United had 550,000 viewers this year. Good point about the NHL where MLS is and isn’t like them here. MLS has a lot of things to go up against, they are a small fish in a very large pond. The NHL is just a big fish in a smaller pond, at least in a hockey-sense (in a US sports landscape they’re a smaller fish). A lot of interesting points here by Garber. He had some other interesting quotes about Kansas City and their stadium. For the full article, click here.